August was a very good month for New Horizons. 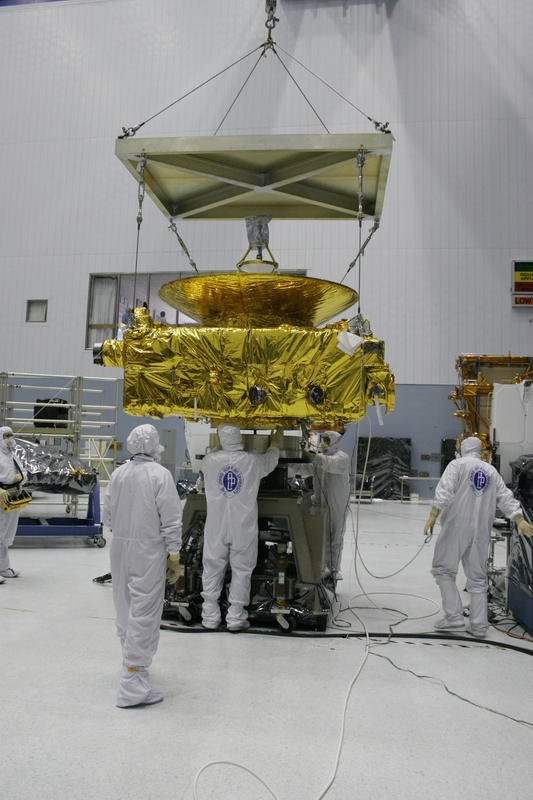 We completed the 6-week long space-environment (thermal vacuum) testing of mankind's first spaceship to Pluto. Thermal vacuum testing included thermal balance, followed by multiple transitions of the spacecraft to hot and cold temperatures while in vacuum, several mission simulations, numerous payload instrument performance tests, and tests with NASA's Deep Space Network (DSN). The thermal vacuum testing was the last step in our pre-flight environmental test program (earlier tests included vibration, spin balance, and launch acoustic loads). The successful environmental testing campaign we just completed is a credit to a dedicated and talented Applied Physics Laboratory/NASA Goddard Space Flight Center/Southwest Research Institute/contractor team of engineers, technicians, and scientists. This team was led by our integration and test (I&T) manager, Mike Colby. Mike and his team are my heroes - for keeping us to schedule and making what is very hard look very easy. 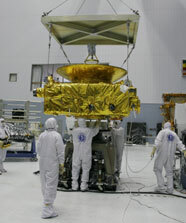 The New Horizons team readies the spacecraft for spin-balance tests at NASA's Goddard Space Flight Center. Another very important milestone accomplished in August was the completion of the multi-month acceptance testing of our spacecraft flight software. APL's Debbie Clancy and her team get the kudos for this big milestone. As we enter September, New Horizons continues with mission simulations and software testing. Additionally, we expect to complete the repair of our finicky solid state data recorder, install fresh, flight detectors in the Solar Wind Around Pluto (SWAP) plasma instrument, and resolve an intermittent problem in an electrical connector that affected the control of one of our attitude control system latch valves. I'll be back in touch a month from now in this space. By then, New Horizons should be in Florida! Before I go, I have to remark on something that is, truly, remarkable. While New Horizons was completing its vacuum chamber testing, news emerged of the discovery of two Kuiper Belt Objects (KBOs) almost as large as Pluto. Even more exciting was the discovery of an object larger than Pluto - and three times as distant - way far into the classical Kuiper Belt. The object is provisionally called 2003 UB313; someday soon it'll receive a more poetic name. But no matter what we call it, UB313 is an exciting find for planetary science. On the next page you'll find a commentary that I wrote on the meaning of this discovery to planetary science; this also ran in the August 29 issue of Space News. 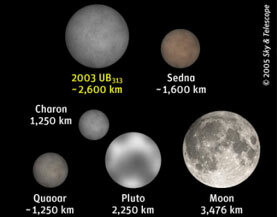 Pluto is our best chance to study the emerging population of dwarf worlds of the outer solar system, shown here in comparison to the size of Earth's moon.